October 25, 2014 October 25, 2015 Simona Lidia Z. Where Lemons Blossom attended yesterday afternoon the States-General of Tourism, organized by the Municipality of Pesaro in the breath-taking setting of Villa Caprile: one the best places in town to invite experts in the tourism sector to speak about future strategies to adopt in order to increase the number of tourists in our area. As a matter of fact, 70% of the GDP of Rimini (renowned sea-side resort in the neighbouring region Emilia Romagna, about 30 kms north from Pesaro) is due to the tourism sector, whereas only 8% of Pesaro GDP is generated by tourism. However Mattteo Ricci, mayor of Pesaro, underlined the great talents that Pesaro has to offer in the field of culture (it’s the hometown of composer Gioachino Rossini, it organizes Rossini Opera Festival, it’s close to Urbino – the ‘ideal Renaissance city’ – UNESCO World Heritage site), of art, history, nature, family facilities (a well organized beach and a safe low sea-bottom for children) and sport (let’s not forget our 80-km-long cycling lane), eno-gastronomy (truffle, wine, olive oil, cheese) and much, believe me, much more (those of you who follow me know what I’m talking about!). Enzo Belloni, Municipal Council Member for Tourism, was the moderator in the evening session (it was he who invited me to take part to the States-General of Tourism and I’d like to thank him). I found interesting the speech of Pietro Talarico, Manager of the Tourism Section of Regione Marche, and of Amerigo Varotti, Vice President of the Chamber of Commerce of Pesaro and Urbino. I would say that all speeches had in common one theme, i.e. that of building a shared strategy and of establishing a collaborative working relationship between all actors: public bodies, trade associations and private sector. So, let us all unite to promote Pesaro and our beautiful province (Pesaro and Urbino)! 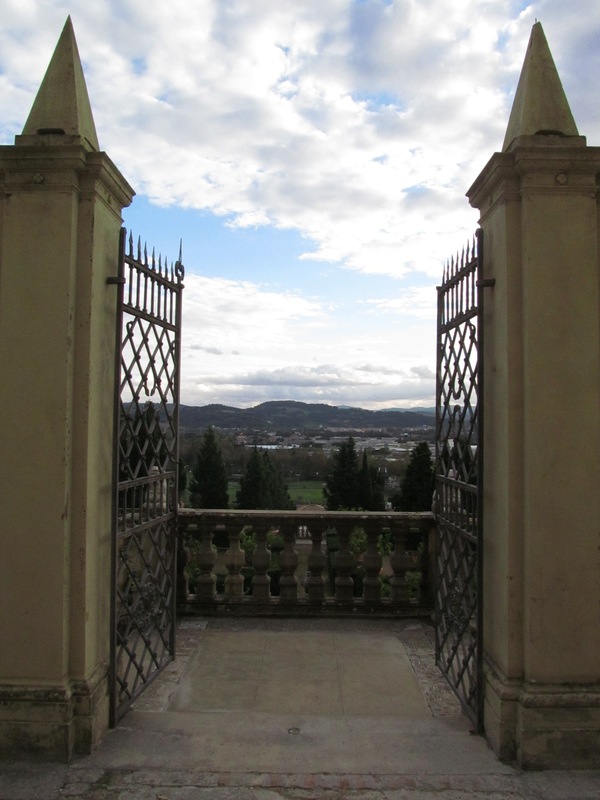 Following are a few pictures of Villa Caprile. The beautiful villa, with an Italian garden, was built in 1640 by the marquis Giovanni Mosca from Bergamo and hosted, later on, famous guests such as Casanova, Stendhal, Rossini and Leopardi. The 17th century façade is a perfect scenary for the garden, rich in exotic plants and water games. The gardens, along the gentle slope, are arranged in three terraces connected by large staircases. The first one, with a double flight of stairs, is the oldest. It leads to the first garden hosting the famous water games which take the visitors aback with sudden splashes of water coming out from vases, monuments and hedges. A 2 km-long filtering gallery was built at that time in order to receive the waters. The second garden hosts the so-called pomario with fruit trees and plants, according to the Arab gardening tradition, typical in the Spanish culture. 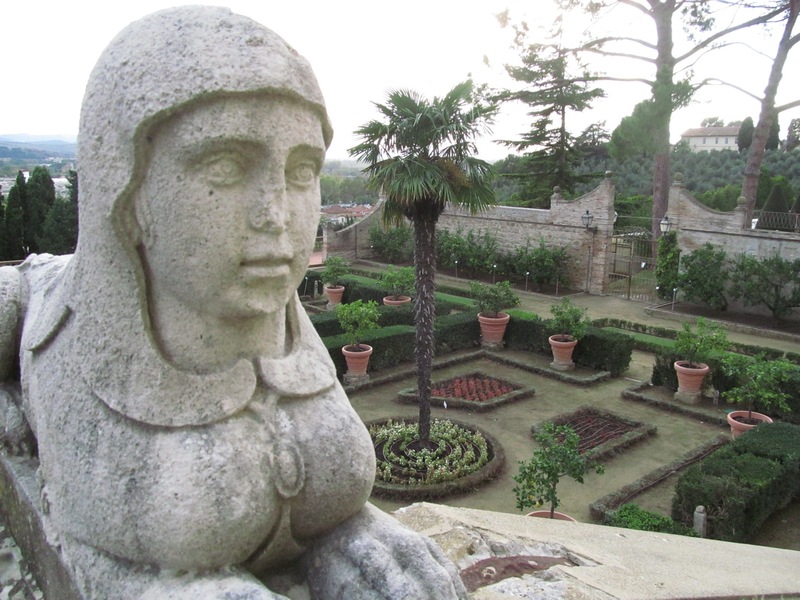 The third garden hosts the viridarium, with aromatic herbs such as sage, rosemary, juniper, tyme, etc. To top it all the green theatre (“teatro di verzura”) surrounded by cypresses and entirely made of plants and trees, including stage and seats. Villa Caprile today is the seat of the agrarian technical institute. Its beautiful gardens with water games are open to the public in the Summertime. Thank you, Rhonda. I’m fond of these places as I’m fond of travelling and sharing the beauty I find here and there! I was fortunate to find your blog after doing a little research on Pesaro and Urbino. The area has been calling me. I also noticed we have something in common…Badia a Coltibuono. I would like to discuss more with you.